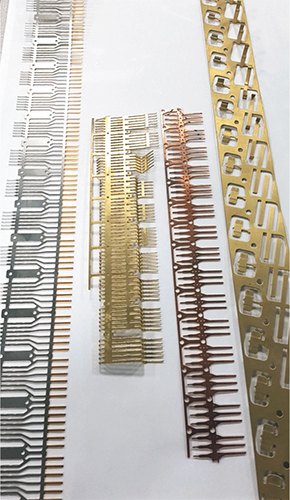 KSR International, a leading vertically integrated Tier One supplier of electrical and electronic components to the transportation industry, knows a thing or two about the challenges involved with producing tiny and sensitive parts. Since 1946, the global company, with headquarters in Ridgetown, Ontario, Canada; manufacturing facilities in Canada, Mexico, China, Czech Republic and the United Kingdom; and sales, R&D and engineering offices in the United States, Canada, Germany, United Kingdom and China, has designed, engineered and manufactured such products as electronic throttle control pedals, position sensors, power modules and voltage regulators. As tooling/manufacturing engineer for KSR, Roberto Cafarelli, an automotive-parts veteran, having worked for Magna and Martinrea, manages tooling designs and oversees the equipment used in the manufacturing of KSR’s various product lines. These require precision terminal pins for fast connects and disconnects in various applications found in automobiles, light trucks and all-terrain vehicles, as well as hybrid and electric vehicles. The volume and speed with which these tiny parts must be made is mind boggling. On average, says Cafarelli, the company stamps terminal pins at rates of 150 to 350/min., or about 15,000/hr. Annual volume runs about 14 million. What’s more, the precision tooling is fragile and the materials used must remain oil-free during production. “The carbide tools used for cutting are prone to shattering when encountering static vibration,” explains Cafarelli. “And the materials—bronze, copper, stainless and aluminum—used in making the parts must be oil-free, so they can be sticky. This requires the stamping press to provide a means to prevent the parts from sticking and adhering to the tooling. To manufacture the pins, a servo-feed delivers the strip into a high-speed press, where it travels through a 10- to 20-station progressive die. 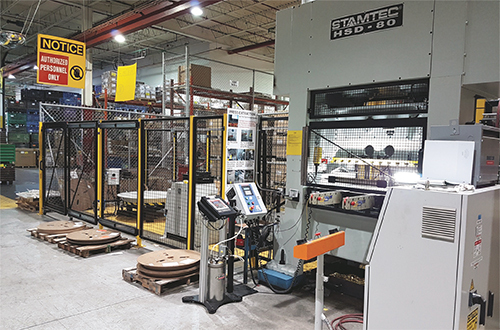 A customized high-speed press provides KSR International with the capability to produce terminal pins to the tune of about 15,000/hr., with annual volumes reaching 14 million. The parts are used in various automotive, light-truck and all-terrain-vehicle applications, as well as in hybrid and electric vehicles. Cafarelli says that all production challenges related to the terminal pins are met by a customized Stamtec HSD-80 high-speed straightside press. Originally designed to run motor laminations, the 80-metric-ton press has many features not standard in a typical straightside machine, allowing it to reach KSR’s required high-volume-production rates while addressing material concerns and other challenges, says Michael Wisnoski, integrated systems engineer for Manchester, TN-based Stamtec. Also serving to lessen deflection is the eccentric-shaft design, with “more bearing surface, and better torsion and deflection characteristics than a typical crankshaft machine,” continues Wisnoski, explaining that the shaft is machined from one solid-steel piece. “Because of the eccentric design, the shaft is supported along its length, and with the support bearings placed closer to driving points, shaft deflection is reduced. The press also has a hydraulic slide-adjustment locking device, standard on all Stamtec high-speed presses. The device hydraulically locks the slide-adjustment threads to eliminate clearances and ensure consistency of the slide’s position at bottom dead center.